Throughout Mark, Jesus behaves in an offensively inclusive manner, pointing to the reality of an offensively inclusive kingdom. 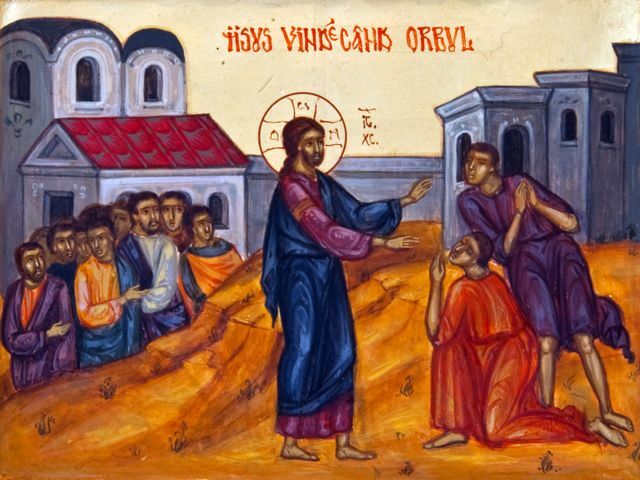 His eating with sinners and tax collectors (Mark 2:13-17) shocks the Pharisees, and Mark arrests his readers by noting that Jesus touches just about every ritually unclean character he encounters. This narrative dynamic is made explicit in Mark 7:1-23. The episode opens with a powerful contrast with the previous summary account that reveals how Jesus and the Pharisees regard the kingdom of God. When they had crossed over, they landed at Gennesaret and anchored there. As soon as they got out of the boat, people recognized Jesus. They ran throughout that whole region and carried the sick on mats to wherever they heard he was. And wherever he went—into villages, towns or countryside—they placed the sick in the marketplaces. They begged him to let them touch even the edge of his cloak, and all who touched it were healed. The Pharisees and some of the teachers of the law who had come from Jerusalem gathered around Jesus and saw some of his disciples eating food with hands that were defiled, that is, unwashed. (The Pharisees and all the Jews do not eat unless they give their hands a ceremonial washing, holding to the tradition of the elders. When they come from the marketplace they do not eat unless they wash. And they observe many other traditions, such as the washing of cups, pitchers and kettles.) (Mark 6:53-7:4). Because he is the agent of God’s kingdom presence, Jesus radiates healing. When he touches the unclean he radiates purity. Jesus goes through the marketplaces fearlessly, bringing the restoring and renewing reign of God. When the Pharisees go through the marketplace, they fear impurity, so they wash themselves upon returning. These are two alternative conceptions of how to approach “common people,” and they constitute two different visions of the kingdom of God. One approach arranges a social hierarchy of purity that operates under the illusion of God’s approval. The other is radically inclusive with no social hierarchy and operates with the confidence that God’s embrace is wider than human conception. Hm, i think i like this Tim. Nice one. Good thoughts Tim and I think this reflects the NT portrayal well. Don’t have a complete answer, but what do we do with the fact that the “purity hierarchy” was one believed to be established by God through the Torah? It seems that in Mark 7:1-23 Jesus rebukes the Pharisees for taking the clean/unclean separation from the Temple cultus and applying it to everyday life. This is a misuse of these distinctions, even though the Pharisees would have felt well-motivated in doing so. The distinctions do indeed come from Torah, but they’re misapplied and they do damage because they result in a social hierarchy that is not only not endorsed by God but works against the dynamics of the kingdom of God, according to Jesus. He re-orients purity in a way that doesn’t overthrow Torah, but the human tradition. Good writing and good exegesis, in my opinion.